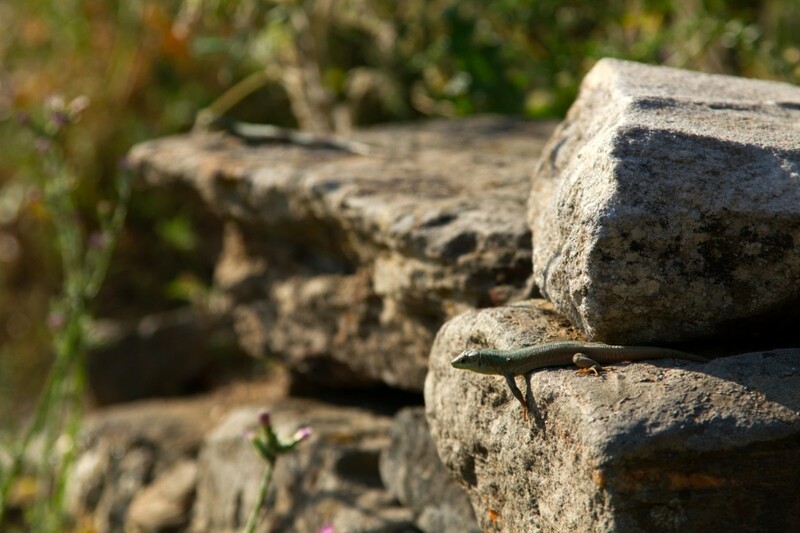 One of Colin's aptly named Aegean wall lizards. 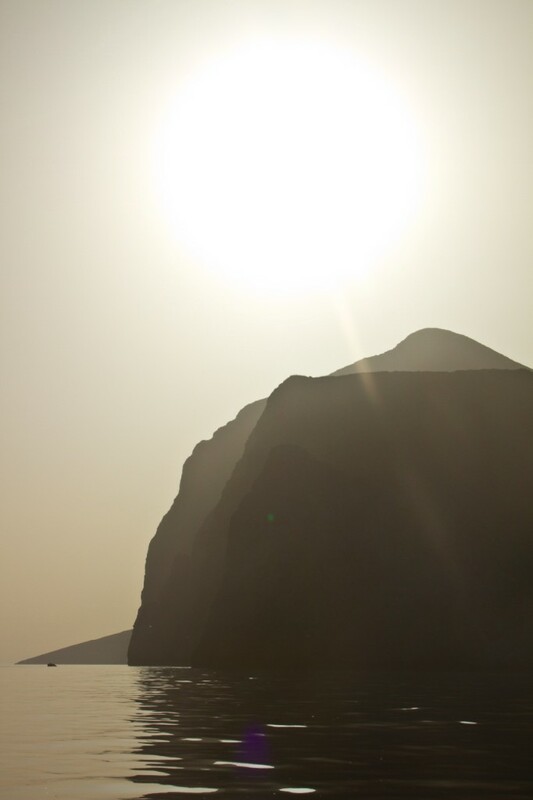 Sunrise over one of the islands. 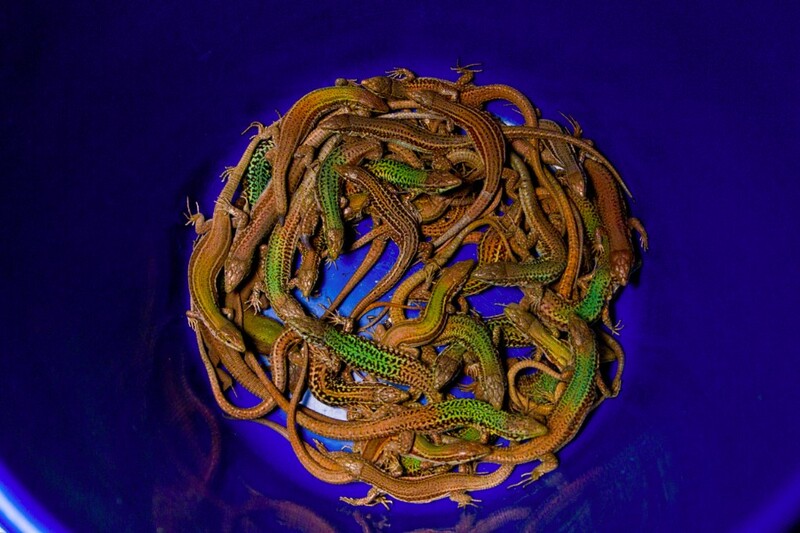 A bucket full of Aegean wall lizards. Colin shows off a handful of his study subjects. A panoramic view of one of the islands. One of the walls where Colin caught lizards. Fishing is a common source of income around these islands. Colin with one of his lizards. Photo by Amanda Swain. 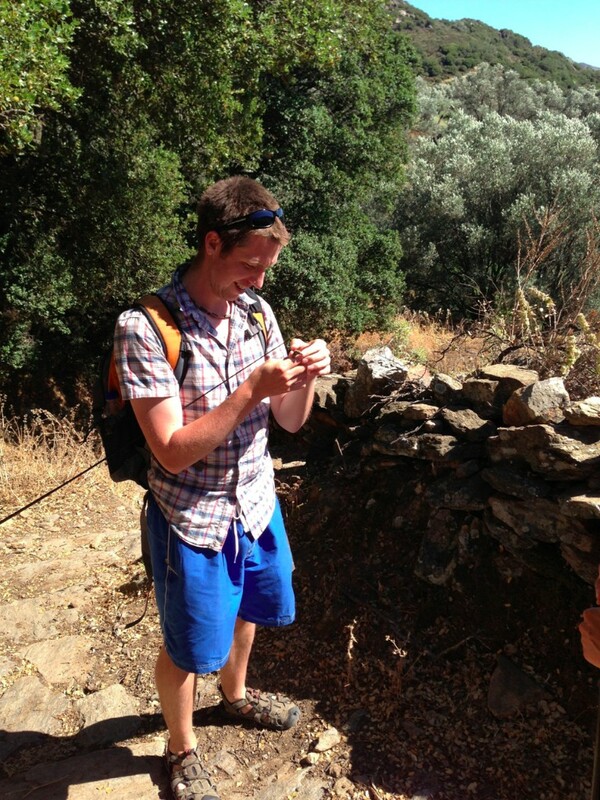 Greece has a long history of goat grazing and stone wall building. As such, it provides an ideal setting for my studies on the effects of human land use on ecological communities. The Aegean Sea, to the south and east of Athens, is dotted with hundreds of islands, each with their own land use history and portfolio of plants and animals; these islands are my laboratory for comparative studies on the effects of wall building on local flora and fauna, especially lizards. In the Cyclades, my “home base” cluster of islands between Crete and mainland Greece, it is rare to see a stone wall without a lizard perched atop. Because most are built without concrete or other sealants, these walls are lizard havens, with mazes of halls and balconies perfect for escaping predators including snakes, cats, and birds of prey, or warming up in the sun. The most common lizard, and the one I’m focusing my research on, is suitably named the Aegean wall lizard, Podarcis erhardii. Given the close association of these lizards and the walls they live in, my research investigates whether lizards are changing their behavior, morphology or physiology to use these man-made structures and whether any changes that are occurring might affect other species, particularly insects and plants, in the ecosystem. This past summer I addressed these questions in two ways, testing for differences in a suite of lizard traits between islands with different ecological settings, and also testing for differences in lizards on the same island with differences in human land use. My preliminary results suggest that lizards on walls differ in behavior, morphology and performance from lizards in settings without walls. Next summer, I am designing a multi-island manipulation experiment that will involve building walls and introducing lizards to eight small islets in order to test whether these lizard trait changes are directly attributable to the stone walls, and whether these changes have cascading effects on the insects and plants of the community, as theory predicts. I spent my summer in Naxos, the largest island in the Cyclades. Naxos’ most famous feature is its ancient temple of Apollo. From Naxos, I took ferries and small fishing boats to 25 nearby islands in the Cyclades ranging in size from a football field to many miles in length; some were inhabited with fishing villages and others are wonderfully remote and human-free. Wherever I went, I was always in search of lizards. Most were too fast for hand-catching, so I used little string nooses on the end of fishing poles, or, even more successfully, small mealworms for bait. 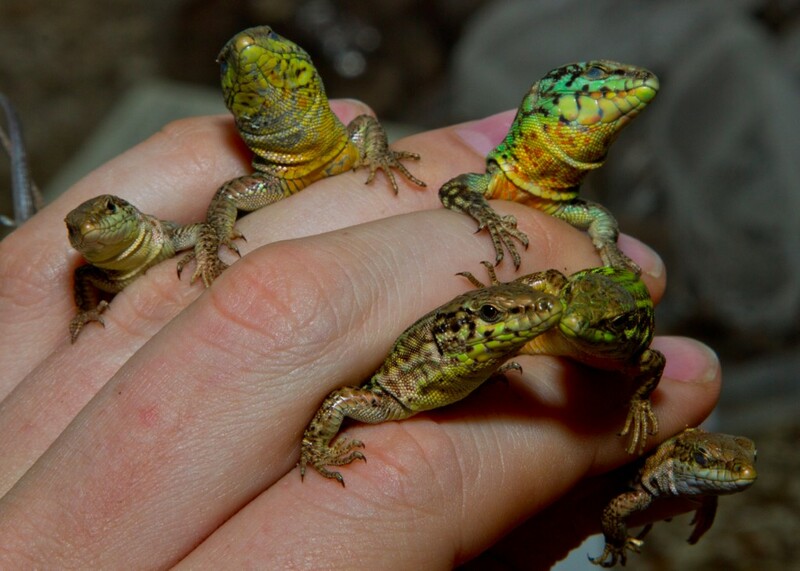 I caught, measured, and released several hundred lizards over the course of the summer. On these trips I also saw a variety of other species, including several small sand boas, many “four lined snakes,” though this individual is from a unique population that mysteriously lacks lines, and lots of other critters. Among the most memorable experiences was going out at dawn to reel in nets with one of the fishermen ferrying me from island to island. His boat was small and jumped on all axes in the stormy seas. We hauled in miles of nets catching fish that had swum by during the night and trawling the bottom for anything else in our path. It was an eye-opening experience seeing the true cost of by-catch. 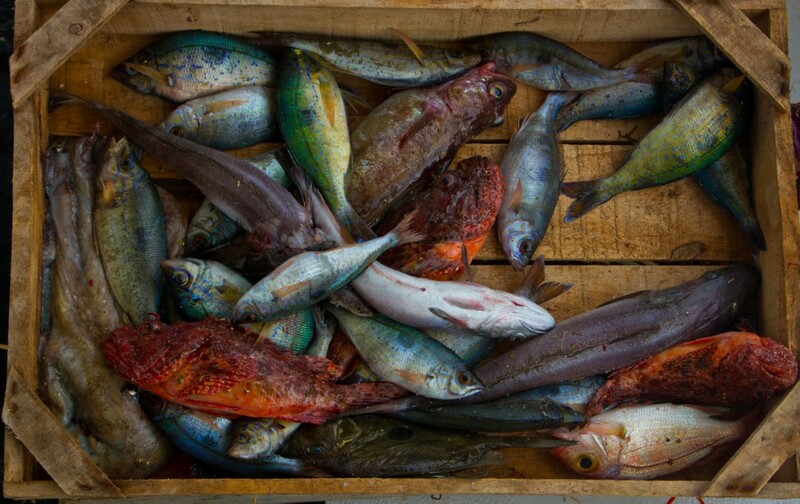 We ended up with an impressive haul, but the fishermen were disappointed; fish stocks are in steep decline in the Greek islands. There is much still to learn about the roles humans play in the ecological dynamics of the Greek islands. I look forward to continue exploring this beautiful, diverse, exciting landscape. Colin is a PhD candidate at the Yale School of Forestry & Environmental Studies. Since I am your Grandfather’s first cousin from Canada, and I met you at your grandparent’s house, I would just like to let you know your research is very interesting. Your great grand uncle , my Dad, Edward Campbell would think what you’re doing is just great. He loved the land , the trees and the animals. A teacher, he would bring stories into the classroom about what he saw and felt in the woods, and the lands around Lake Ainslie. You have a rich heritage ! My daughter Susan and her husband have raised two wonderful young men who like the parents and aunts will make a difference in this world. So glad we were able to make the connection with you all. Lake Ainslee people are special.